Before I start, I should note that the friends I mentioned a few weeks back, as well as their newborn child, are doing very well. However, there will inevitably be some challenges over the coming weeks and months, so please keep them your thoughts. If you want to stay updated on their progress, you can head over to their CarePages blog here (free registration required). Anyway, as you have probably surmised from said stolen title (which is really the best possible title for something like this), the main reason I'm writing this post is because the University of Pittsburgh canceled classes on Monday 8, Tuesday 9, and Wednesday 10 February. The reason? All the snow, of course! 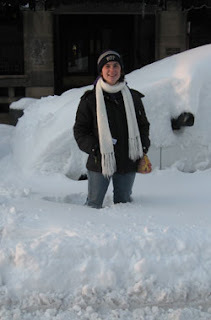 That's my friend Marie at right, standing in the freshly fallen snow that came down on Friday 5 and Saturday 6 February in front of a car parked in front of our apartment. I was standing in the middle of the street to take the photo, which was largely fine, as nobody was really driving at the time (and if they were, they were painfully slow, giving ample time to get out of the way). The official total for the weekend storm at Pittsburgh International Airport was 21.1 in (53.6 cm), and from how things looked, that sounds about right. Obviously, if I had a yardstick, I'd have checked myself. But short of taping my rulers together, I have no way of measuring anything higher than a foot on my own. And that would be a terrible waste of tape, not to mention the inaccuracies involved. So I have to trust the authorities on the matter. Then on Tuesday and Wednesday we got another 7.9 in (20.1 cm) from a separate storm as the city scrambled to keep up, and we're still getting a few flakes even now. Fortunately, they've been better at keeping up lately (although still far from perfect, according to many complaints). Anyway, I've actually got classes today. That is, of course, unless the people planning to push snow into the roads to prevent that do something drastic in the next few minutes. But somehow, that seems unlikely. Monday and Tuesday, as each day was canceled, I found all sorts of things to do to occupy my time. Some were fairly important and others were rather frivolous, but the point is that I kept switching from one to the other thing and no real progress was made on anything. But Wednesday, I decided to just pick something I would enjoy and see it through to a reasonable end. It should be noted here that most of the projects I enjoy don't really have an "end", so this just meant staying "focused" to some degree or another regardless of what "other things" I could be doing. Basically, I was ignoring all "opportunity costs", to get back in the mode of the macroeconomics lecture I'll be attending in a couple hours' time. Anyway, as fun as it was not knowing what was coming next and having copious amounts of time to do anything, there is something to be said for routine. I'm glad that we're done stagnating for now and I'm excited to move forward. Even if that means the next 36 hours are a crazed kind of busy as a result!